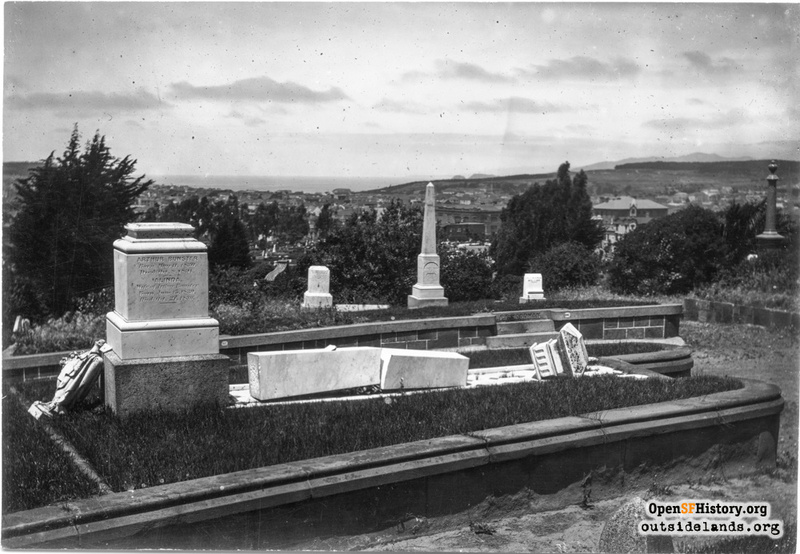 At the turn of the twentieth century most of San Francisco's dead were interred to the northwestern part of the city. In January of 1899, my great-great grandmother ended her life by hanging herself in a closet. The family's grief was terribly compounded by an anonymous letter sent to the police and coroner accusing her husband of poisoning her and faking the suicide. 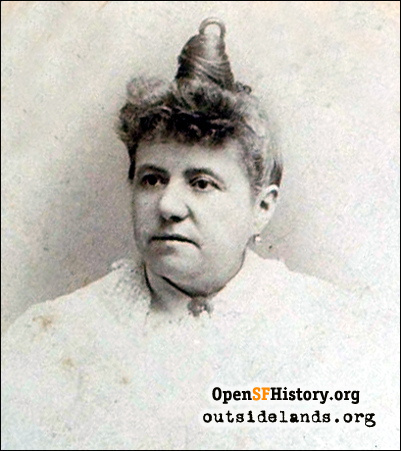 All of the major San Francisco newspapers followed the story, publishing sketches of the poor woman and reproductions of the finger-pointing letter. My great-great grandfather, John Emil Slinkey, was dragged through an inquest and the body of his wife, Christine Dern Slinkey, was exhumed from Laurel Hill Cemetery and examined for signs of foul play. No poison was found by the coroner, John Slinkey was exonerated, and Christine was returned to her eternal resting place. 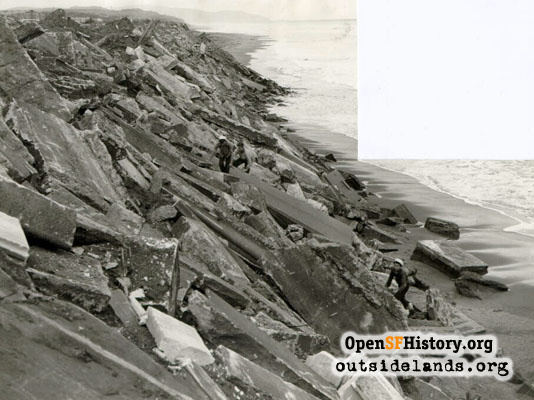 That is, until her son Milton moved her again, twenty years later, to keep ahead of the plan by the Board of Supervisors and the voters of San Francisco to haul tens of thousands of graves out of city limits. At the turn of the twentieth century most of San Francisco's dead had been interred in the northwestern part of the city. Golden Gate Cemetery loomed over the mouth of the bay (today the site of the Palace of the Legion of Honor and Lincoln Park golf course). The Marines Hospital cemetery sat just inside the Presidio. 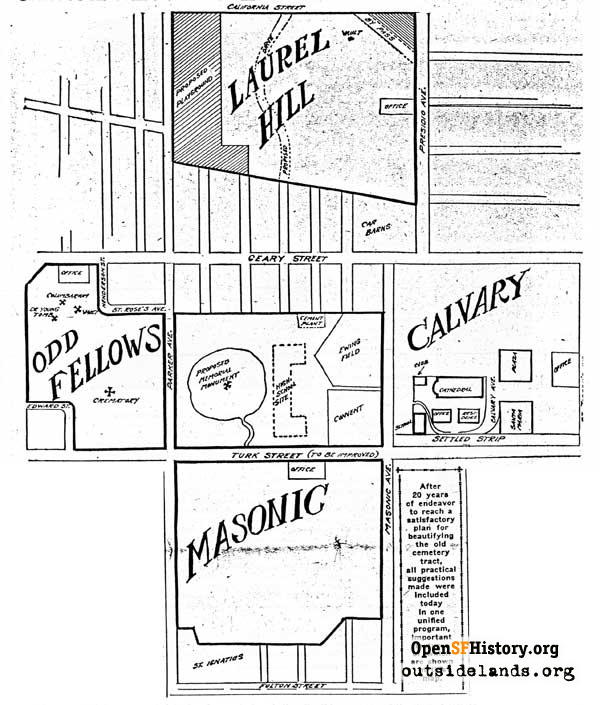 The major burial grounds, however, surrounded the intersection of Geary Street and Masonic Avenue, where the "Big Four" did business. Map of proposed changes at the Richmond District's Big Four cemeteries, early 1930s., circa 1930 - San Francisco News? Masonic Avenue owes its name to the Masonic Cemetery that lay on the current site of the University of San Francisco's main campus. The Catholics sent their departed to the consecrated ground of Calvary Cemetery, where the Anza Vista district and Kaiser Hospital are today. Rossi Playground and the Franciscan Heights neighborhood used to be part of another "final" resting place. Only the Columbarium, which still peeks over at the traffic on Geary Boulevard and Stanyan Street, remains of the Odd Fellows Cemetery. Laurel Hill Cemetery, which was originally called Lone Mountain Cemetery, occupied the Laurel Heights development and shopping center, with the paramount spot taken by a University of California, San Francisco campus (the Firemen's Fund insurance company headquarters from 1953 to the early 1980s). The supervisors listened. On March 26, 1900, the board prohibited further burials within city limits after August 1, 1901. The revenue for burial charges and lot sales now disappeared for the cemeteries in place. Only perpetual-care lots had the funds to be maintained. Quickly, the Big Four's land of the dead, which was also the gateway to the growing Richmond District, began to deteriorate. Neighborhood groups and local papers like the Richmond Banner lobbied for years to have the graves removed. Justifications ranged from concerns over homeless encampments and crime, to the impediment of business growth, with a frequent complaint being the inconvenience of having streets from downtown (such as Bush and Post) dead-end at Laurel Hill. After numerous legal battles and various proposals for the cemeteries to transition into parks, public housing, and even the new Lowell High School, the cemeteries eventually lost out to public pressure and the voters of San Francisco. 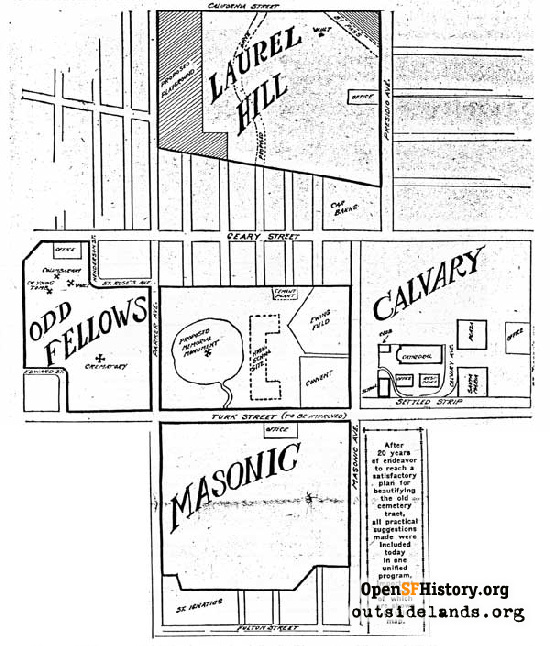 The Masonic and Odd Fellows associations went first, taking their bodies down the peninsula to Colma (then called "Lawndale"). Influenced by the opportunity to use the former Masonic burial grounds as the site for the University of San Francisco, the Catholic Archdiocese gave up in 1937 and transferred Calvary's occupants south to Holy Cross Cemetery. The biggest battle came over the elimination of Laurel Hill. Pioneers, renowned local heroes, and families of great wealth lay under the scrub and lawn of the eighty-year-old cemetery. Were the bodies (and impressive monuments) of Senator David Broderick, Civil War hero Colonel E.D. 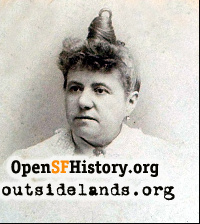 Baker, Andrew Hallidie (inventor of the cable car), and Thomas Larkin to be dragged unceremoniously out of the town they helped shape? Eventually, it became so. Over 35,000 bodies were removed from Laurel Hill in a year and a half. The cemetery attempted to contact heirs, relatives, and plot owners to make private removals and reinternments, if wished. Of course, this effort wasn't always successful, and unclaimed headstones and monuments were carted away by the Department of Public Works. 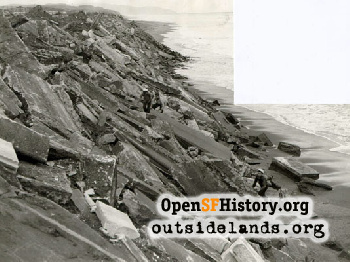 Stone memorials to thousands of San Francisco dead helped build sea walls at Aquatic Park and Ocean Beach. Pioneers that helped build San Francisco had their gravestones used for rain gutters in Buena Vista Park. World War II slowed down development plans, but in the 1950s the commercial and residential districts moved in. The Richmond District business owners didn't get their dead-end streets eliminated, but settled for a short jog connecting Bush Street with Masonic Avenue. The records say my peripatetic great-great grandmother now lies with other relatives in a common plot in Cypress Lawn Cemetery in Colma. There's no marker now; perhaps it's holding up part of the marina. I hope her last move was a relatively peaceful one. I still shake my head in amazement that they moved the dead out of town. They actually dug everyone up, pauper and society matron, so they could build more houses and supermarkets. As a kid I watched movies at the Coronet Theater, took swimming lessons at Rossi Pool, played baseball at Laurel Hill Playground, got fitted for school shoes when the Sears department store was on the top of the hill. USF students are lazing on the grassy quad. Cars are waiting to find parking at Trader Joe's. Homeowners are pruning hedges in Anza Vista. All closer to the grave than they know. Bibliography: Location, Regulation, and Removal of Cemeteries in the City and County of San Francisco, William A. Proctor; Richmond Banner, April 4, 1924; Necropolis North of the Panhandle, Greg Gaar, Haight Ashbury Newspaper, 1982.